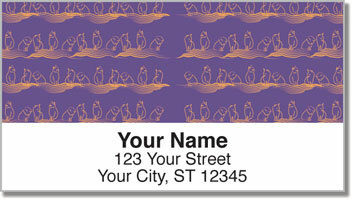 Here's a stylish choice for cat lovers who want to mark their mail with something artistic and adorable. These mailing labels display the outlines of three little kittens against four vibrant backgrounds. It's the perfect way to personalize letters and packages with the dignified poise and delightfully aloof attitude of cats. You love cats because they have a mind of their own. Comedian George Burns named his cat Willie. That's because he said, "when you tell a cat what to do, there's always the question of will he or won't he?" But there's no question that you'll love your new labels. Thanks to a handy, self-adhesive backing, all you have to do is stick one on each envelope. 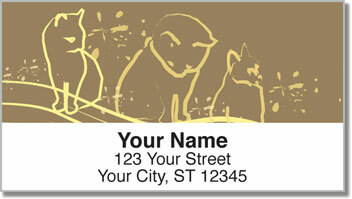 No more scribbling out your return address! 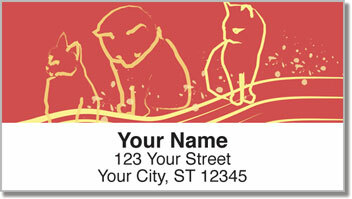 Get your very own Cat Sketch Address Labels today! Don't forget to add some matching personal checks.